Relish in exquisite dining experiences at our enticing selection of restaurants and bars. Wake up to a sumptuous breakfast buffet and dine all day at The Pool House, overlooking Kamala Cove. Feast on authentic Thai and international cuisine at Sunset Grill, with stellar sunset ocean views, fresh local meat and seafood and market-fresh vegetables are grilled to perfection. Let our mixologists concoct you a refreshing cocktail, at The Pool Bar, and delight in the panoramic Andaman Sea views. Delicious fine BBQ grill with a view to dine for Sunset Grill overlooks our Resort and stunning sunset views . With prime cuts of meat, the freshest local seafood and market vegetables prepared to perfection. The contemporary setting is ideal for romance and the perfect place to relax and admire the lights on the horizon. Whether relaxing with a homemade Thai iced tea or sipping on an exotic cocktail, The Pool Bar is the place to chill, mingle, hangout or party the night away with our resident DJ. 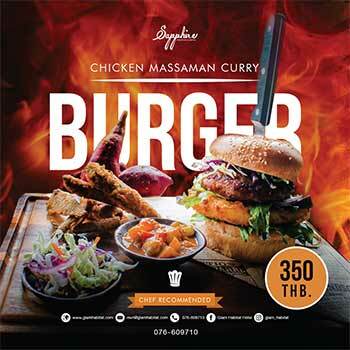 Feeling peckish, then order eats from the menu and dine poolside on Thai and international cuisine. At dusk, relax by the pool with a wine and watch the sun go down. Whether its snack-attacks in the wee hours, lazy lunches or a romantic dinner for two with your favourite wine under the stars on your balcony, Room Service from our restaurants in Phuket is waiting to serve you. The full food and drinks menu is yours to order, any time of day or night without leaving your Phuket hotel rooms.